Every summer barbecue or picnic needs a fresh, seasonal salad and we love this colorful, full-of-spice salad from Cuban chef Ronaldo Linares. His newest cookbook features new and traditional recipes that are diabetes-friendly and meet the nutritional guidelines of the American Diabetes Association. His recipes, featured in both English and Spanish, will simply wow your taste buds! In his beautifully spiced salad, peaches are first lightly browned with vanilla and aromatic spices which give this sweet fruit a beautiful pop of flavor. 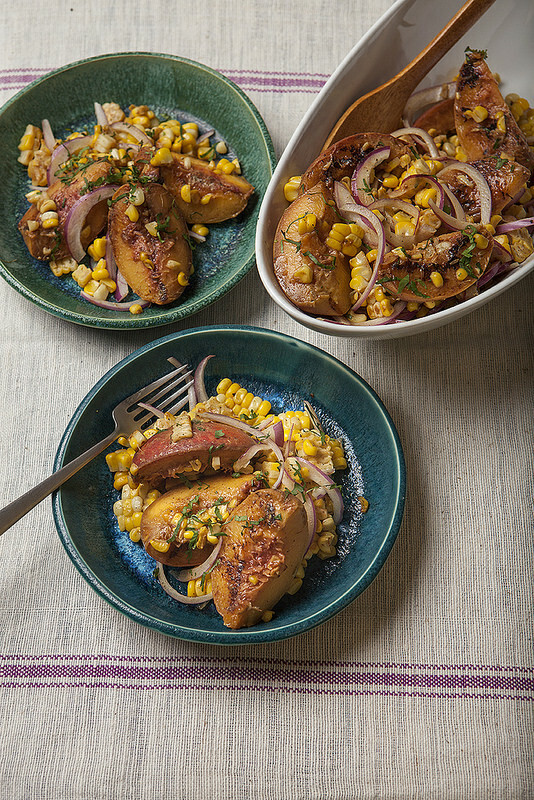 The peaches are then combined with corn and red onion then given a zesty dressing of low-fat Greek yogurt, lime juice, a blend of more spices, and fresh cilantro, which all make this dish sing! Step 1. To a large bowl, add peaches, vanilla, nutmeg, cinnamon, and 1 teaspoon avocado oil, and toss gently. Step 2. Preheat a medium nonstick pan over medium heat. Add peaches to the pan and lightly brown them on both sides. Transfer to a small baking sheet and place in the refrigerator. Step 3. Place corn in a pot of cold water and bring to a boil until corn is cooked through, about 10 – 15 minutes. Remove from water and cut in half. Step 4. Preheat a medium nonstick pan over medium heat and add 1 teaspoon avocado oil. Wait 10 seconds and then add corn. Lightly brown all sides of the corn. Transfer corn to a small baking sheet and place in the refrigerator. Step 5. Once peaches and corn are cool, remove from the refrigerator. Cut the corn kernels off the ear; add to a bowl along with the peaches and add onions. Step 6. To a separate bowl, add all dressing ingredients. Whisk together until it reaches a smooth consistency. Add dressing to corn, peaches, onions, and toss gently. Serve. Reprinted with permission from The American Diabetes Association. Copyright © 2016 by Ronaldo Linares. From Chef Ronaldo's Sabores de Cuba. Photography: Kelly Campbell Photography.